A panel discussion, moderated by We Effect´s regional director Hans Lind at the launch event in Nairobi. In the picture also Dr. Chiyoge Sifa, Regional Director, International Cooperative Alliance and Joyce Naisala, programmes and partnership manager of the national NGO-board. With the new five-year programmes, We Effect’s strategy narrows down from four to two programmes. The already well-established Adequate-Housing and Sustainable Rural Development programmes, will promote a better future, especially for rural women. With a clear focus – and stable funding – We Effect kicks off the new programmes for 2018-2022. More than 23 million dollars will contribute to noticeable impact for many projects and people in the region. Today about 5,2 million people are linked to the cooperatives engaged in partnerships with We Effect in East Africa. The new strategy and programmes have been presented and signed in Nairobi, Dar es Salaam, and Kampala – to bring on board the partner organisations and agree on how to work together these coming years. But the focus remains clear, for both We Effect and the partners. – Our main target, is to emphasize gender equality, and work among the least privileged groups, namely women and girls, We Effect´s regional director Hans Lind said, when announcing the new programmes. During the launches, the We Effect team gave all partner organisations an introduction to the new guidelines, and discussed lessons learned and visions for the coming programme period. On top of We Effect’s two main themes, Sustainable Rural Development and Adequate Housing, there are three cross cutting themes, gender equality, environment and financial inclusion, deeply integrated in the work in the region. In this way, the work with the main targets of empowering women, strengthening the co-operatives and fighting poverty can be achieved together with the partner organisations in the region. 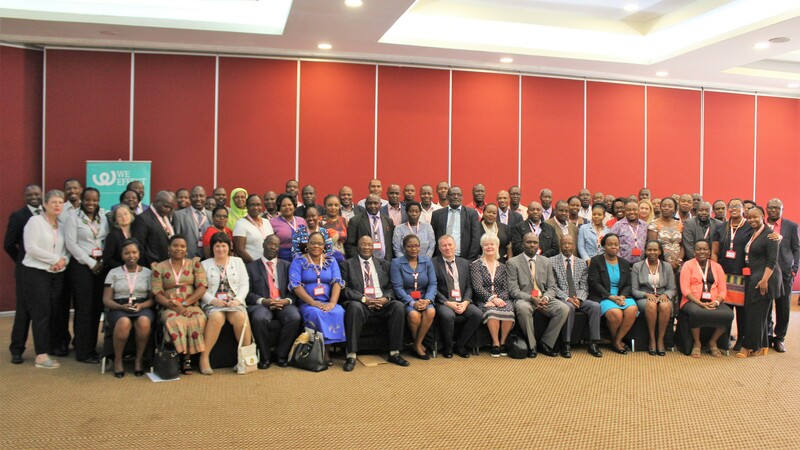 Eleven Tanzanian partner organisations signed the new 5-year programmes. 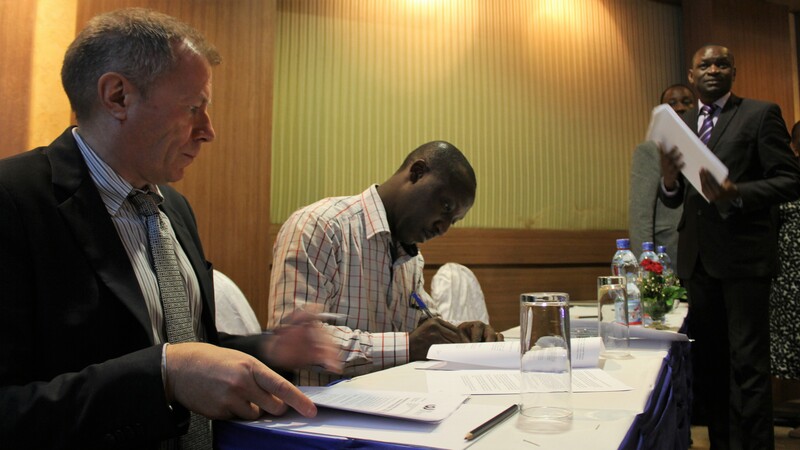 Regional director, Hans Lind (left) receives one of the signed contracts, assisted by George Onyango, program director of We Effect. Since the start of We Effect’s work in East Africa in 1964, the work has grown big in the cooperative field regionally. Today, We Effect counts 43 partner organisations in Kenya, Uganda and Tanzania. In total, the work reaches 5,2 million members in cooperatives or related organisations. And the organisation keeps growing. Despite the number of programs decrees from five to two, the spectra of work remain. The main target is to battle poverty, especially among the most vulnerable groups, women and girls. This will be done together with cooperatives, spread over the three countries. Already established work within gender equality, environment, leadership and financial inclusion, will from now be included by the partner organisations all over the region. All indicators show the work is on the right track, together with the partners. The vision and goals – to fight poverty through encouraging gender equality in societty – is proven to be the right way to go. The launches in all three countries were all attended by state officials, representing the three counties, Kenya, Tanzania and Uganda. 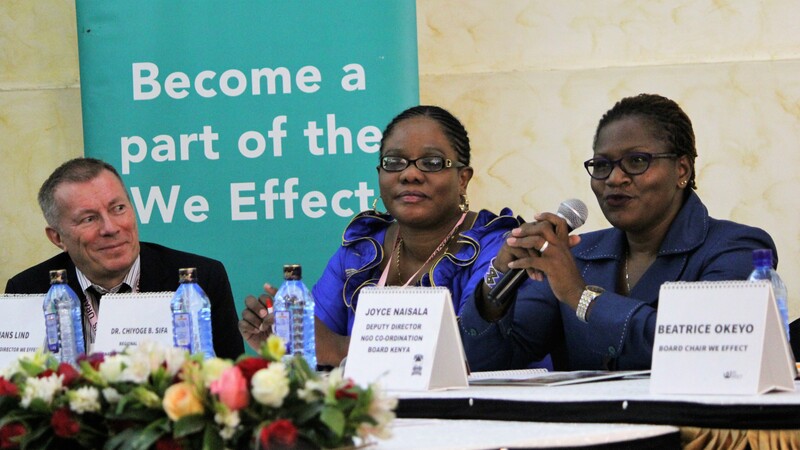 During the Nairobi event Ms. Joice Naisala, deputy director for NGO board of Kenya, participated in a panel discussion, giving the government´s view on the role We Effect is playing in development. The launch in Tanzania, was attended by both Swedish ambassador, Ms Katarina Rangnitt and Mr. Elimpaa Y. Kiranga, Principal Agricultural Officer of the National food security division. At the event in Kampala, both the Ugandan minister of cooperatives, Gume Ngobi Fredrick and first secretary Johan Bergqvist, from the Swedish embassy attended, giving speeches on the need for a strong actor in the cooperative field in the country. 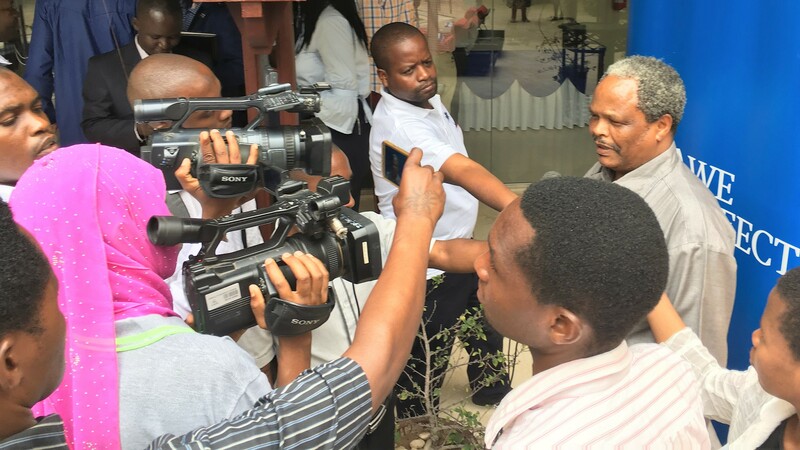 Mr. Elimpaa Y. Kiranga, representing the Tanzanian food security division was popular with the media, after the announcements of the new partner programmes in Dar es Salaam. We Effect is working together with stable partners, with a long-term perspective. We Effect, celebrates its 60th anniversary this year; a proof of a reliable and solid organisation. The signing of the new programmes, confirms that the partners share the same strong belief in the continues work in East Africa. 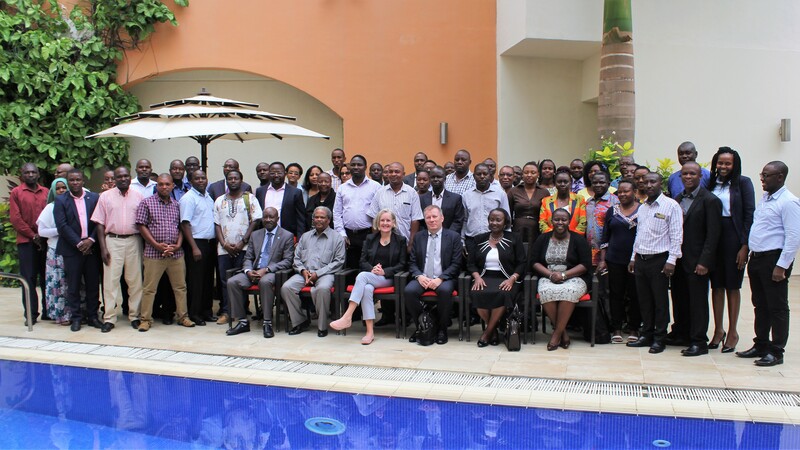 The launch event in Dar es Salaam, Tanzania was attended by, among others, the Swedish ambassador, Ms Katarina Rangnitt and Mr. Elimpaa Y. Kiranga, Principal Agricultural Officer of the National food security division.